Free: This tour is for SHS members only. Join Dr Imran bin Tajudeen who has been researching this significant part of Singapore’s history as he shows what this important site preserves of our past and the dire need to protect it. 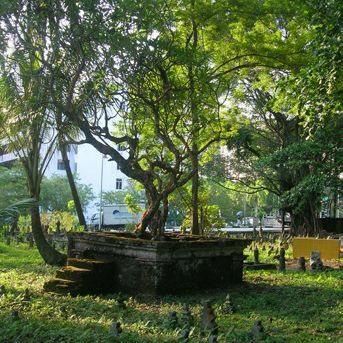 The graveyards around Jalan Kubor off Victoria Street, Kampung Gelam, is the only sizable cemetery connected with early 19th century Singapore – and possibly with settlements preceding 1819 – that is still largely undisturbed. It is an important part of Kampung Gelam’s history but has been excluded from the “Kampong Glam Conservation District” boundary. Forming part of the old royal port town that was developed when Tengku Long of Riau was installed as Sultan Hussein in Singapore, it is aligned along the royal axis of the town. within this compact site is the final resting place of numerous traders and individuals of diverse ethnicity from the old port towns of our region and beyond – neighbouring Riau, Palembang, and Pontianak, as well as Banjarmasin, and Javanese and Bugis ports further afield, as well as persons of Indian and Arab descent. Some of these individuals are buried in family enclosures, mausolea, or clusters. This walk will highlight tombstone forms and epigraphies that are previously unknown, and bring up the immense variety of forms and written scripts that reflect the socio-cultural diversity of the Malayo-Nusantara community of Kampung Gelam and other Muslim communities from further afield. Dr Imran bin Tajudeen is an Assistant Professor at the Department of Architecture, National University of Singapore. He is the lead research consultant for Nusantara Consultancy, which recently completed a research project initiated by the Malay Heritage Centre and National Heritage Board to document Jalan Kubor. His research interests centre around vernacular urbanism, house and mosque architecture in Southeast Asia, and critical perspectives in urban heritage studies. Of relevance to this walk, his article,‘Reading the Traditional City in Maritime Southeast Asia: Reconstructing the 19th century Port Town at Gelam-Rochor-Kallang, Singapore’ was published in the Journal of Southeast Asian Architecture in 2005. His research papers have won prizes at major international conferences, including the ICAS Book Prize 2011 for the best PhD paper in the field of Social Sciences.